Credit: Library and Archives Canada / Acc. No. 1991-12-46 / Gift of Joan and W. Ross Murray, Whitby, Ontario. Merry Christmas from Leeds and Grenville Branch. Our Archives will be closed Monday, December 24th, re-opening Wednesday January 3rd, due to the closure of The Brockville Museum during that time. We wish you all the blessings of the holiday season, and a happy, healthy and successful New Year! Enjoy time with family and friends, and make some family history memories to cherish! 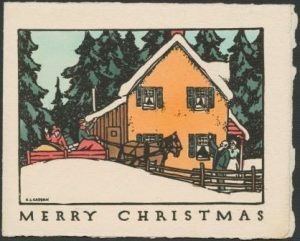 This entry was posted in News and tagged Brockville Museum, Christmas Hours, Genealogy on December 19, 2017 by admin.